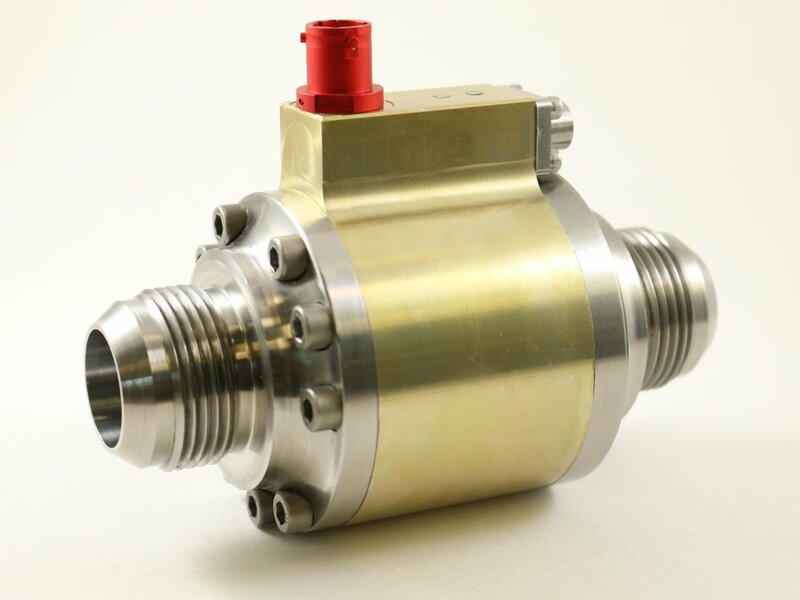 The TS-160Y Pyrotechnically Actuated Poppet Valve (patent pending) is a revolutionary new high pressure, high flow poppet valve ideal for high pressure fluid systems used in rocket propulsion applications such as sounding rocket main propellant valves, pressurization system isolation valves and emergency pneumatic blow down systems. We recognize that some applications in the emerging sounding rocket market need high flow rate valves like our TS-160S, but require only a single “open” valve actuation (as opposed to the many “open/close” cycles possible with our TS-160S). To serve this market, we have developed a lower-cost, single-use product, the TS-160Y. The TS-160Y has equivalent flow performance and pressure rating of the TS-160S, but is pyrotechnically actuated with the TS-LCI100 pyrotechnic initiator (details here) and opens in less than 100 milliseconds. Once fired the valve remains open until upstream pressure decays to zero, then the pyro cavity may be vented and the internal shuttle spool reset for another use. The TS-160Y may be reused many times, unlike most pyrotechnically actuated valves, which makes it ideal for low cost sounding rocket applications. With a starting price of only $4,399 and significant quantity discounts available, the TS-160Y provides a unique capability to the emerging low cost sounding rocket world. We believe in providing our customers with all the information they need to make a decision as quickly as possible. For this reason we provide up front pricing for all our products, displayed here on our website. With Triton Space you will never have to ask for a quote and then wait days to find out if our products are in your price range. We work tirelessly to deliver phenomenal products at highly competitive pricing and we don't feel the need to conceal that pricing behind antiquated quoting paradigms. Thank you for your interest in the Triton Space Technologies TS-160Y! Someone will contact you shortly to provide further information.